From the Twin Peaks television series and the film "Twin Peaks: Fire Walk with Me"
Mark Frost and David Lynch's Twin Peaks is a cult classic. Though the series was classified as a drama and written like a soap opera parody, it delved pretty deeply into horror, surrealism and the supernatural. There's a lot in Twin Peaks for a geek to love, including Fox Mulder killing it as a trans-woman. 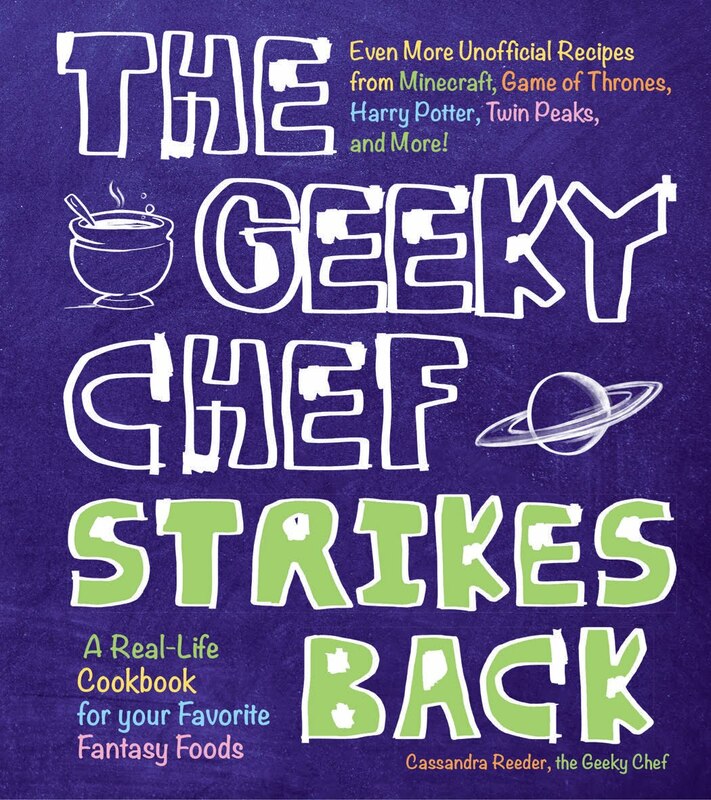 It even inspired a video game, Deadly Premonition, which in turn inspired a delicious and sinful recipe in The Geeky Chef Cookbook. 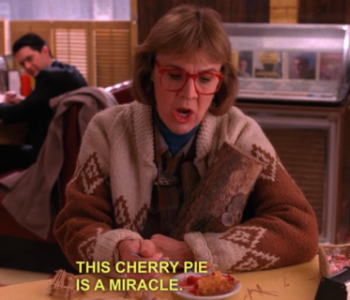 In October of 2014, it was announced that Twin Peaks would be getting a long awaited and much deserved reboot on the Showtime network. The future of this reboot was briefly in question when David Lynch distanced himself from the project due to an apparent lack of investment on the part of the network. However, it seems that things are coming back together. 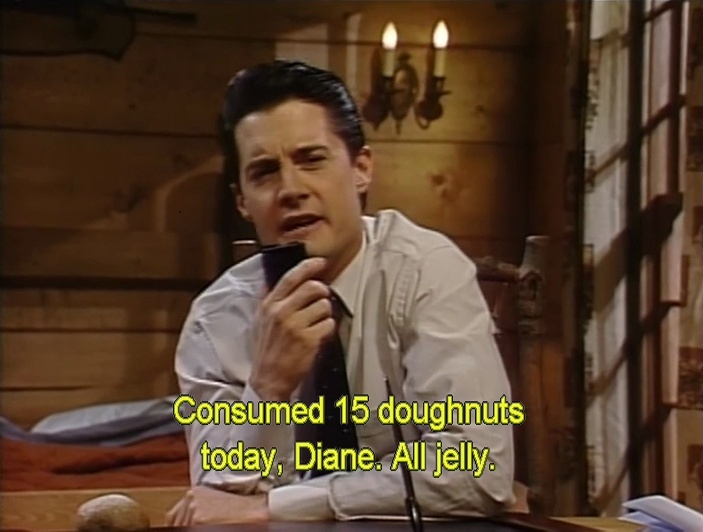 Twin Peaks did have a lot of fantastic food moments, like this, and this, and especially this. 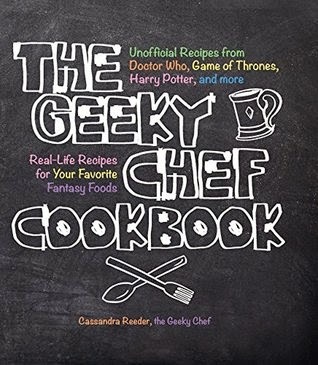 However, there's only one fictional food: Garmonbozia. Garmonbozia is what the spirits of the Black Lodge eat. It is basically a corporeal manifestation of sorrow and pain, or negative energy. Humans cannot comprehend it's true form, so it takes on the likeness of... creamed corn. Now, I know many of us do associate creamed corn with pain and suffering because, in most cases, it is truly awful. 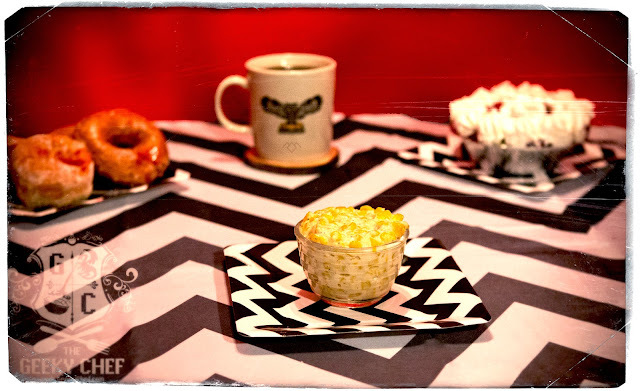 I would like to assure you that this will be the best creamed corn you ever tasted and you will relish every last bite, just like the spirits of the Black Lodge. 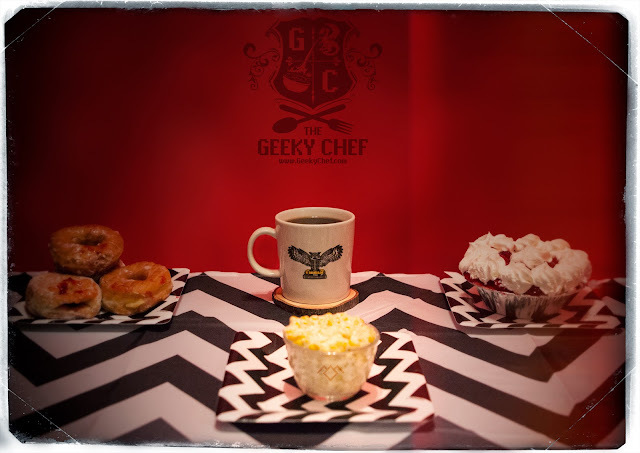 Perhaps you can finish your meal with a slice of cherry pie and some damn fine coffee at the Double R Diner— or maybe just an obscene amount of jelly donuts. In a saucepan, combine corn, cream, butter, cream cheese and seasonings. Bring to a simmer over medium-high heat. In a separate container, whisk together the milk and flour thoroughly. Slowly pour the milk/flour into the saucepan with the corn and stir as you pour. Continue to simmer until the sauce thickens. Stir in the romano cheese until it melts and blends into the sauce. Um, Twin Peaks love aside, I was looking for a good corn recipe for memorial day tomorrow. This looks DELISH! I love all the subtle references in the images too. Great job! Thanks so much! We had a fun time propping the images. I hope you enjoy all your Garmonbozia!